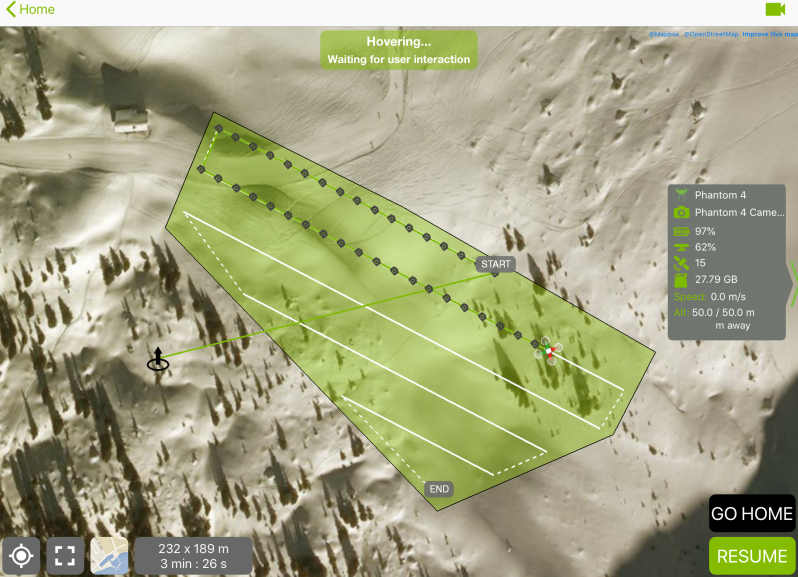 You can fly a multi-battery mission with Pix4Dcapture. 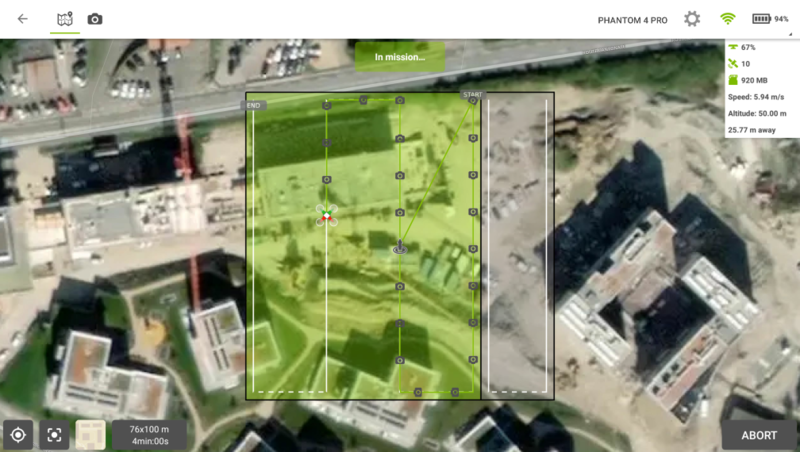 Pix4Dcapture for iOS and Pix4Dcapture for Android provide different workflows to perform a multi-battery mission. Tap ABORT. Your drone will start to loiter, and Pix4Dcapture will create a new flight plan that covers the remainder of your project area. Tap GO HOME. Your drone will return to land at its home point. Tap START. Your drone will start capturing the remainder of your project area. Note that your drone will start capturing photos at the beginning of the flight line that it was flying in the previous mission when you tapped Abort. Tap PAUSE. Your drone will start to loiter. Tap RESUME. Your drone will start capturing the remainder of your project area. Note that your drone will continue capturing photos just after the location of the latest picture acquired before you tapped Pause. To be clear, using IOS devices, Pix4D Capture will resume at the last image captured point, or at the beginning of the last INCOMPLETE Mission Flight Line? Also, to maximise battery usage, at what percentage will the mission abort and the drone Return To Home by itself? If it does do that before ABORT was tapped, will it be able to continue the mission where it left off, when the battery is changed? In other words, MUST one abort a mission for THAT mission to be continued? Or is Pix4D Capture clever enough to use maximum battery power on its' own, return to home and continue the mission itself once a new battery is loaded? Thank you for your relevant questions. 1. on iOS, Pix4Dcapture will resume at the last image captured point. 2. On Pix4Dcapture, a warning is displayed while the battery is going below 30% but in any case, the RTH will be triggered up to what you defined in DJI GO 4. 3. To change the battery on the drone, tapping PAUSE at any time, waiting for the RTH to be triggered when it reaches the battery percentage defined in DJI GO 4 or tapping the RTH button on the RC is equivalent. Pix4Dcapture will take it into account and then you can RESUME the mission. Am I reading this right when I assume that multi-battery flights is not possible with an Android device in a double-grid (3-model) mission? Yes, you are right, on the Android version of Pix4Dcapture, a multi-battery flight can be done with the simple Grid mission. It is not possible at the moment to make it with the others types of missions. Is there a demo video on this? You should not go through DJI GO 4 when changing the battery. Multi-battery flights can be operated having only Pix4Dcapture running on your mobile device. Note that DJI GO 4 should not be running the same time that Pix4Dcapture as it can lead to communication conflicts with the drone. It is recommended to force quit DJI GO 4 when using Pix4Dcapture. We do not have any videos about multi-battery flights at the moment. can i have a long mission in double grid mapping for the survey in multiple flights. is it possible when i choose 1km square to be mapped and it uses 162 flights in the same mission ?? It is possible to make a multi-batteries flight with a double grid mission using the iOS version of Pix4Dcapture. Hello gael is it possible to get the same thing in android ?? Is multi-battery flights possible with an android or ios device in a double-grid (3-model) mission? - Grid mission for Android. - Grid, Double Grid and Polygon missions on iOS. Whilst using grid map on Android 9.0, I selected Abort to complete battery swap. All appeared to work fine until drone 1/2 way back home when map duplicated the existing flight plan but 50 metres ~45° from where the initial map was located. Looking at the app screen, both maps appeared with the new -- and now inaccurately placed -- showing as the active map. In thinking I accidentally moved the map, I attempted to replicate and was successful on the next 2 battery swaps. As a user during the fight -- usually ~15 mins in -- I pressed Abort > Go Home > drone paused, followed RTH height, proceeded to RTH > map in Pix4d app duplicated same size but 50 metres & ~45° from where the initial map was located. If tapping ABORT in a Grid mission with the Android version of Pix4Dcapture, the behavior expected is explained in the above procedure. It might happen that if tapping ABORT --> GO HOME too quickly, it will not work as expected and a duplication of the first flight plan may be done. Before tapping GO HOME, we suggest to be sure that the new flight plan that covers the remainder of your project area is created. ABORT >> GO HOME When I pressed the button, the drone (matrice210) began to descend to its location. He didn't go where he was. When using Pix4Dcapture, tapping ABORT --> GO HOME will trigger a Return-To-Home. Pix4Dcapture is a third-party application and it cannot override the fail-safe behavior of the drone itself. The Return-to-Home is part of this and then is not handled by Pix4Dcapture. "Something worth remembering is that if your drone is less than 20 meters away from you when you press the RTH button then it will land just where it is, however, if the landing zone is hazardous then it will try to find somewhere safe to land or just hover at a low height until the pilot takes control and lands it manually."